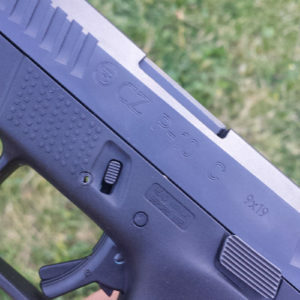 Being that I am a huge fan of CZ firearms, I was excited when CZ announced they were coming out with a new model called the CZ P-10C as their newest polymer framed striker fired model in 9mm and .40 S&W. 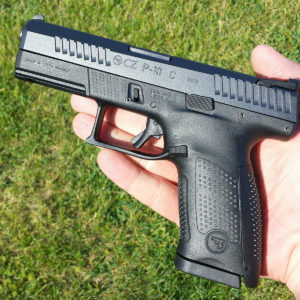 Not only I but the firearm community as a whole embraced the CZ P-10C by calling it a potential “Glock Killer.” This gun was sharp looking with nice ambidextrous features and a very light trigger. Honestly, I wanted to sneak it home with me from Shot Show 17. Eventually, after much anticipation, CZ finally released the P-10C. I was fortunate to get my hands on one and immediately hit the range. My expectations were high for the P10C but I figured if the P-10C could fire as smooth and accurate as my CZ P07 Duty and CZ 75B then CZ would definitely have a winner. The CZ P-10C is priced right with the MSRP at $499 however I’ve seen it on sale at various sites for the mid $400s. Initially, it was being sold for much more however at the time of this review, July 2017, the market settled a bit and the price has stabilized in the mid $400s. 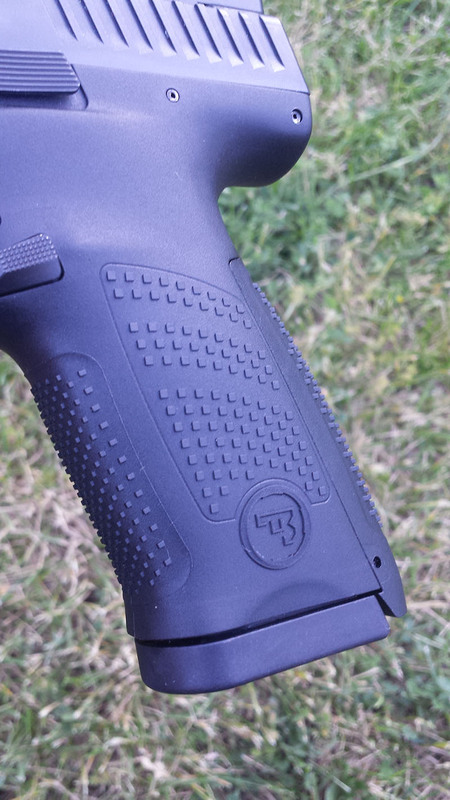 The grips are heavily textured throughout allowing for a solid purchase. I’ve heard some people complain the stippling was too aggressive for carry due to the grip rubbing on the skin but a simple filing job or smooth grip tape will cure that issue fairly quick. CZ offers two additional backstraps however the one installed in the package fit my average sized hands just fine. The two 15 round magazines included looked identical to the P07 mags with clear sight holes for rounds loaded. 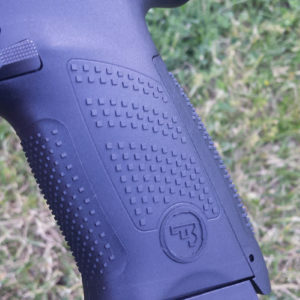 The magazine release button and slide stop lever are both ambidextrous allowing left handed shooters the same ease of control functions as righties. The magazine release button is very tight and initially rather tough to depress. 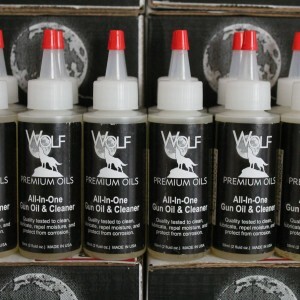 I found that over time along with several rounds down range, the release button loosened up. The forend sports a one slot accessory rail and the slide offers both front and rear serrations coupled with a “not so tight” recoil spring makes charging the P-10C a breeze. 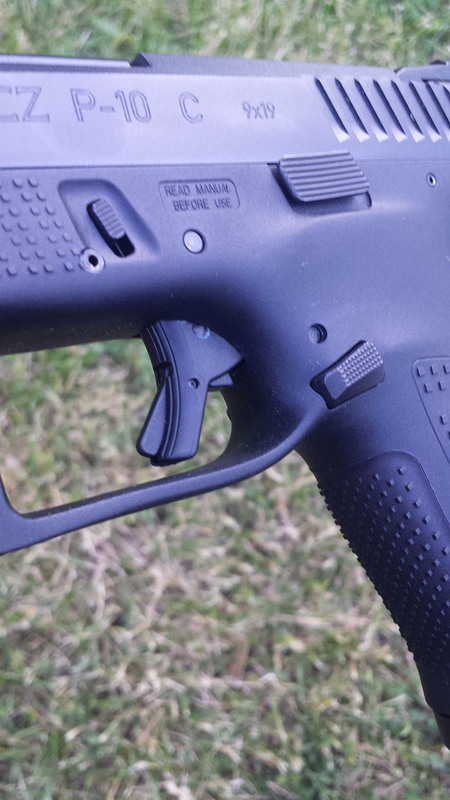 The three dot metal sights are luminescent which means they have a glow in the dark feature much like many HK pistols. 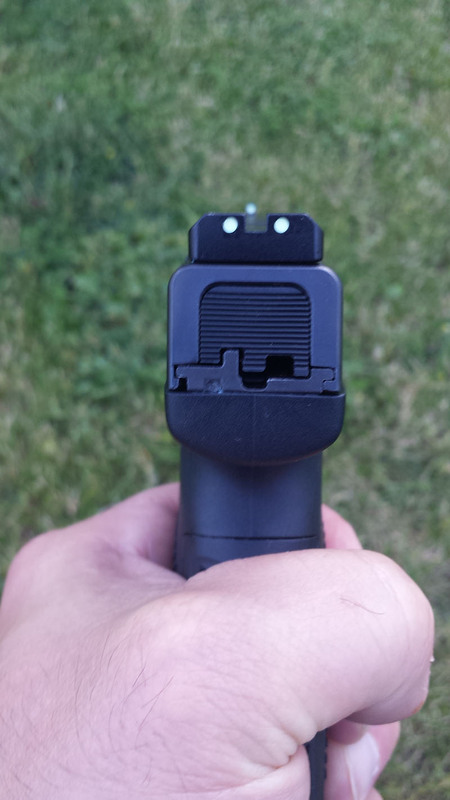 Once charged with light, luminescent sights illuminate very similar to night sights. The one feature that 99% of the people who handle this gun fall in love with is the trigger. The CZ P-10C has a amazingly light and smooth trigger pull with minimal travel before it breaks. I measured it right at 5.25 pounds. It has a trigger bar safety installed and the trigger reset is incredibly short. 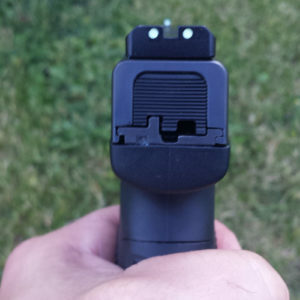 I was impressed with the trigger pull when I first dry fired the pistol but it wasn’t until I took it to the range when I fell in love with the short striker fired action. 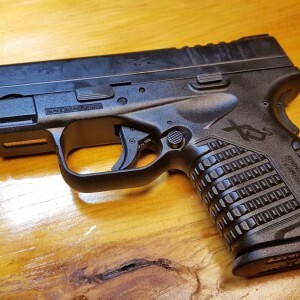 On my scale, the unloaded CZ P-10C weighed in at 25.75 ounces and the loaded magazine weight with 15 rounds of 9mm weighed in at 32.25 ounces. Compared to a fully loaded Glock 19 with 15 rounds, the CZ P-10C weighs two ounces more. To disassemble the CZ P-10C is an easy process and one that many are familiar with. 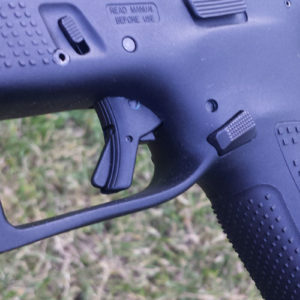 Once removing the magazine and assuring the gun is unloaded, pull back on the slide about a half inch and pull down on the takedown levers just above the trigger. Then by pulling the trigger the upper will easily slide off the frame. By removing the captured recoil spring and 4.02 inch barrel, the CZ P-10C is completely field stripped. 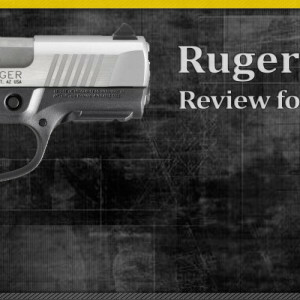 To reassemble, perform the same steps in reverse order without the need to pull the trigger. Ok, so let’s get to the heart of this review. 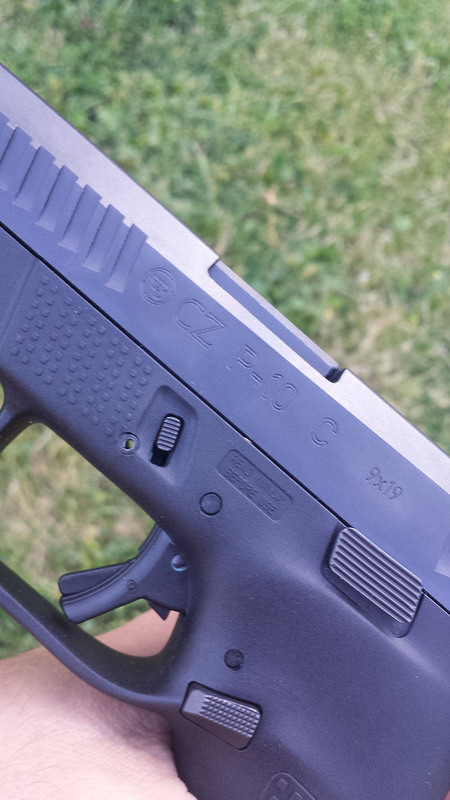 The CZ P-10C was incredibly accurate at the range. Right out of the box I was able to hit my 5×7 inch swinging targets with ease at 10 yards. It was accurate, reliable and smooth. The trigger felt exceptional as the gun pointed and shot very well. I then stepped back to 22 yards while attempting to tag my 10 inch circular target and it felt effortless as I heard the ding with each shot. The trigger was light and quick. The accuracy was equivalent to my P07 Duty and 75B which speaks exceptional high with this gun. I feel the CZ P-10C has lived up to all of it’s hype it received when it was first introduced. CZ did a great job this model and with it priced for under $500, I think it’s a very fair deal. 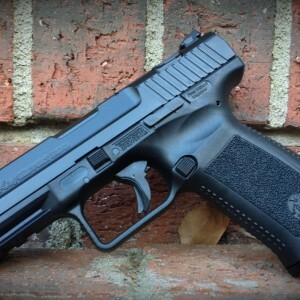 I’m not so sure it will be a Glock Killer however the P-10C has taken it’s own position in the crowded polymer frame striker fired market and in the opinion of this reviewer, they killed it.